Shelley Bourgeois was raised in Prairieville, LA where she began studying dance at a young age. She attended The University of Southern Mississippi where she earned her Bachelors of Fine Arts Degree in Dance Education K-12. 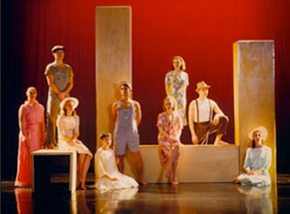 While at Southern Mississippi, Shelley was a member of the USM Repertory Dance Company where she had the honor of performing in works created by Stacy Reischman and Trebien Pollard. In her senior year, Shelley performed "Misery.Love.Company" in the Gala Concert at ACDFA. She is now currently pursuing her MFA in Performance and Choreography from Florida State University. Her choreographic works have been performed in the 2007 Days of Dance and FSU Student Informal Concert. Kimberly M. Holt is a native of Trussville, Alabama. She received her B.A. in dance pedagogy and choreography from Birmingham-Southern College. She then moved to Gainesville, Georgia and taught ballet for the Gainesville Ballet Company. While in the Atlanta area she performed with BigHouse Dance Company, under the direction of Vincas Greene, and Axam DTE under the direction of Dawn Axam. She is currently a third year M.F.A. candidate and has performed in several dance concerts at FSU. She is very excited to be a part of this project and would like to thank Tim Glenn for this opportunity. Rebecca Lee comes from South Carolina where she trained and performed with The Greenville Ballet in Greenville, SC. She received her B.F.A. in Performance and Choreography from Columbia College and was a member of The Power Company in Columbia, SC. She was a ballet teacher and also performed with Ballet Spartanburg in Spartanburg, SC and with Broadway South in Greenville, SC. She has danced with Christian von Howard in the Von Howard Project, and with the Garage Girls a Go-Go in New York City. She is currently working on her Master of Fine Arts in dance at Florida State University. Jason Macdonald, an Orlando native, began his dance training with Melissa Stokes and later studied with Alberto Alonso and Sonia Calero at Santa Fe Community College. He has performed with the New York City Opera and Alabama Ballet Company under Artistic Director Wes Chapman. Mr. Macdonald is currently pursuing a BFA in Dance and a BS in Finance at FSU. Kit McDaniel, born in Miami and raised in the Nation's Oldest City, has been dancing her way through life and is in her fifth semester as a dance major in the BFA program at FSU. She began training at The Dance Company in St. Augustine, FL, and later attended Douglas Anderson School of the Arts. Kit has performed in several MFA thesis concerts, Days of Dance concerts, informal showings, Evening of Dance concerts and is also a returning member of the Dance Repertory Theatre company at FSU. Kit is so thankful for the endless love and laughter she gets from her friends and family, for they are and will always be her muses. Kaley Warren Pruitt is originally from Ketchum, Idaho. She began dancing locally at Footlight Dance Centre then attended Idyllwild Arts Academy for the last two years of high school. She spent one year at The Boston Conservatory before transferring to Florida State University last fall. Along with her love for dance, she has a strong passion for choreography. She hopes to explore the craft of composition as well as contemporary performance in her future. She wants to thank her family for their enduring support and love. Joshua Reaver is currently a sophomore at FSU majoring in Dance. Last year Joshua soared into the department and had the opportunity to work with choreographers Benoit-Swan Pouffer, Dan Wagoner, and Tim Glenn. He currently is a member of Dance Repertory Theatre and has just returned from studying at the Martha Graham Center of Contemporary Dance in New York and the Bates Dance Festival in Maine. When not dancing Joshua enjoys playing guitar and hopes to one day, after his dancing career is complete, become an accompanist playing for various dance classes. Laura Ring recently graduated with a Bachelor’s of Science in Exercise Physiology from Florida State University. Initially starting at FSU as a dance major, she performed in Tim Glenn’s 2005 premiere of Aqueous Myth: Tales of a Water Planet. She is honored to be a part of Embodiments of Silence. She is currently earning her certification in Stott Pilates and works as a Pilates Instructor at Lifelong Fitness in Tallahassee. She is happily married to the man she met in kindergarten. Emily Way is a sophomore dance major at FSU. She grew up in Jacksonville, Florida where she went to school at Douglas Anderson School of the Arts. During that time she also trained and performed as an Ensemble member of the Florida Ballet. Stefan Zubal, originally from Forest Hill, Maryland, discovered ballet while studying music in college. After four years of intense training he joined the Richmond Ballet, dancing professionally with them for seven years, then teaching and dancing with the Fort Wayne Ballet. While in Fort Wayne he also earned his BA in Theatre, with an acting emphasis, through Indiana and Purdue University at Fort Wayne. He is in his second year at FSU as an MFA candidate in dance. During his short time here he has choreographed for the thesis concert of Dr. Robert Raines, PhD and continued his collaborative efforts with the Fort Wayne Philharmonic in Indiana by choreographing A Soldier's Tale. He is looking forward to his fifth musical by choreographing for the FSU School of Theatre's spring production of Hair. Gunnar, one of 15 puppies born to a poor but devoted single mother in rural Jefferson County Florida, sensed that he was destined to adventures that would take him beyond the bird dog tradition of his lineage and the safety of Tealbrook Kennel. He bid farewell to his brothers and sisters at an early age to move to Tallahassee to further his education. There he met and adopted the Brownfield family. It was apparent at that time that he had the raw talent and temperament of other renowned dancers. This will be his début. Alex Davis (Composer and Sound Designer) received a Master of Arts Degree in Film Scoring from New York University, and a Bachelor of Music in Piano Performance from FSU. He began writing music for multimedia projects in 2003, and since then has created scores for more than 50 films, animations, dance videos, and documentaries. His work has been featured in concert at New York University, Lincoln Center, NC School of the Arts, FSU, and on numerous television productions, including the Sundance Channel, History Channel, and ESPN. As Coordinator of the Audio Lab and Recording Studio for FSU Dance, Alex provides technical for music recording, editing and production. Tim Glenn (Director and Choreographer) is an Associate Professor of Dance at FSU working in the areas of dance technology and modern dance. He has truly enjoyed working with the EOS team on this project! Complete biography at www.timglenn.us. J. Russell Sandifer (Lighting Designer) is Co-Chairperson for the Department of Dance along with Patty Phillips. Russell primarily oversees production, accounting, scheduling and personnel issues. In addition, he designs lighting for most of our productions and teaches our visual design and production classes. 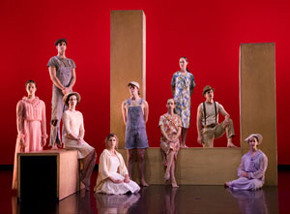 Outside of the Department, Russell continues to design lighting for Seaside Music Theater (since 1984), Suzanne Farrell Ballet (since 2001), and on occasion for Urban Bush Women (since 1998). In all, Russell has designed well over 1,200 dance works, 85 musicals, 8 operas, and a few straight plays in his professional career. Jana Tripp (Additional Editor) received her early dance training in her hometown of Lakeland, Florida. As an MFA candidate in the FSU Dance Department, she has performed in Days of Dance, Evening of Dance, and MFA thesis productions and taught ballet and contemporary dance for the General Studies Program. She has had a wonderful experience working on this project in her many roles as editor, performer, rehearsal assistant, and understudy!